Test kits are made for connecting any hydraulic equipment with standard threaded test couplings M16x2 and fitted micro hose. 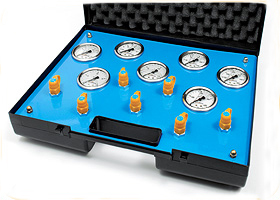 Pressure gauges are fitted with a Bourdon spring and liquid filled (glycerine 99.7%) according to DIN 16005. Diameter 100 mm accuracy 1%. Diameter 63 mm accuracy 1.6%.